Walter Floyd, a music major, has contributed much to the music scene in his four years at the University of Virginia. But his contribution may have taken a completely different shape if not for a fateful decision he made in middle school. A member of University Singers, Floyd has worked as the publicity assistant and volunteer coordinator for the McIntire Department of Music. He also co-chaired the Music Arts Board that brought 9th Wonder, a Grammy Award-winning producer, DJ, college lecturer and social activist, to the University for a vibrant residency in April. Floyd attributes his work in the music department to his involvement with University Singers, the University’s premier choral ensemble. 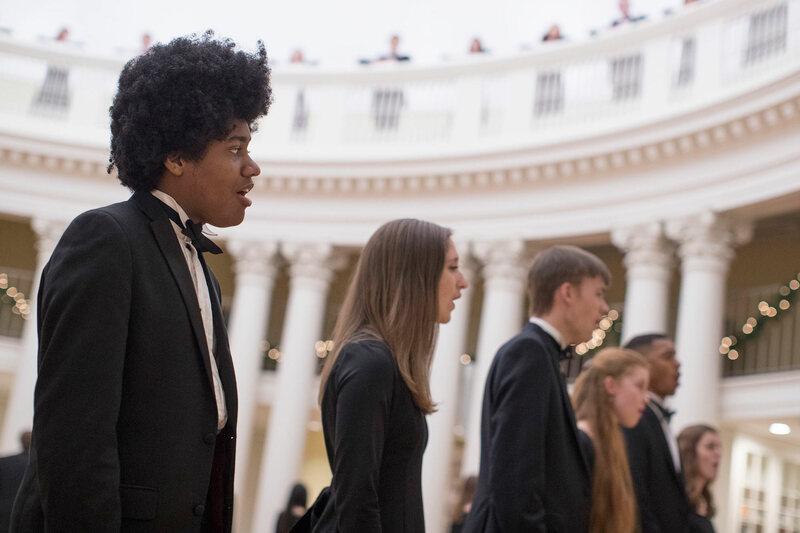 The ensemble performs a cappella and accompanied choral literature, including major works with orchestra. This group was such an integral part of his college life that it’s hard to believe that there was an earlier time he considered not singing. “I sang in high school,” Floyd said, “but originally, I wanted to play in an orchestra. Our school did signups for them in middle school around the same time you’d sign up for choir. My parents wanted me to sign up for choir. Instead, I wanted to do the orchestra. Then my dad pointed out that I’d actually have to learn an instrument. Floyd knew that he wanted to continue singing when he came to the University from Ypsilanti, Michigan. He also quickly discovered that he wanted to be a part of the Music Arts Board. During his first year, the board sponsored a residency with American composer Philip Glass. This inspired him to get involved the next time it presented an artist performance or exhibition for residency – something that occurs on a three-year rotation. 9th Wonder performed, hosted workshops and mentored many music students. One of the things he stressed to those he advised was that while he wouldn’t always be there to help with their music, friends and other music students would be. The experience only strengthened Floyd’s love of music and the University’s musical community, he said. “As a performer, it’s important to think about what art means to you,” he said. “For me, it represents opportunity. Coming from a lower-income background, arts represented opportunity in the sense that it created a very real way for me to finance my college career.” Though he did not have a music scholarship, his involvement with the arts has helped Floyd out when seeking assistance. With graduation looming, Floyd said he wants to continue working in the arts. He hopes to get into fundraising, to create opportunities for future generations of students. This summer, he will get experience by fundraising with the UVA Health Foundation. “This is kind of a pipe dream,” Floyd said, “but a long-term goal I have is to establish either my own endowment or foundation just to help students gain the resources they need to pursue any musical craft. If they need lessons for playing an instrument or voice, or maybe they just need good production equipment, I want to help out with that. Music has shaped Floyd’s life. Thanks to his experiences at UVA, singing will remain a part of his life.